Delight in running Windows or Linux applications on your Mac? That’s right in Parallels Desktop’s wheelhouse, and version 9, which debuted on Thursday, adds even more features to the virtualization program. 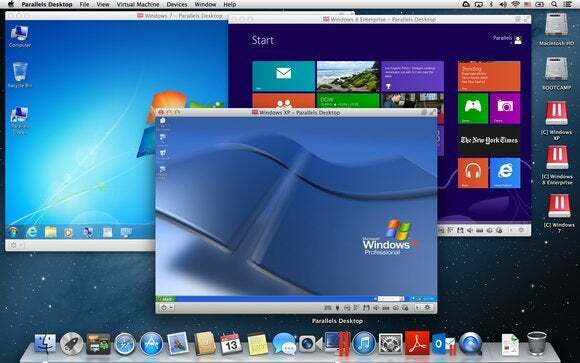 But while the program is currently available as an upgrade for existing users of Parallels Desktop 7 or 8, the full version won’t go on sale until next week. Among the major new features of Parallels Desktop 9 is optimized support for cloud storage services like iCloud, Dropbox, Google Drive, Microsoft’s SkyDrive, and more. You can sync files between your Mac and your Windows virtual machine without having the files duplicated, thus saving you precious disk space. And speaking of sharing features between your Mac and Windows VM, there’s now a single Security Center for using a complimentary security software subscription for both your Mac and Windows VM. 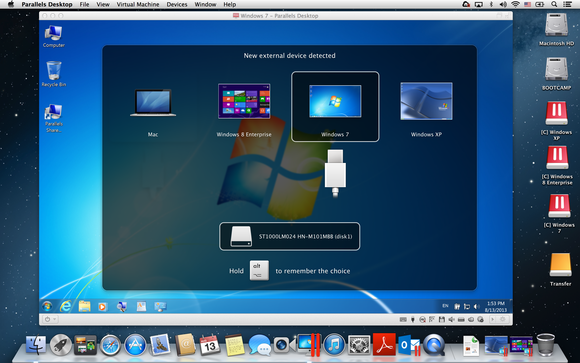 Mac aficionados can now benefit from a number of Apple-like features in their Windows virtual machines, as well. For example, there’s support for Mountain Lion’s Power Nap feature on Retina MacBook Pros and MacBook Airs, letting you keep your Windows virtual machine’s apps up-to-date even when your computer is sleeping. Additionally, you can now use the three-finger-tap in Windows apps to look up words in OS X’s Dictionary, connect storage volumes to your Windows VM via Thunderbolt and FireWire, and print to a PDF on your Mac desktop right from any Windows application. You can now connect external drives to your Windows VM using FireWire or Thunderbolt. Also present is improved support for Windows 8 and 8.1, including the return of the real Start menu, and the ability to run modern UI apps in a window, rather than just fullscreen. Enhancements to the Virtual Machine wizards simplify setting up a new VM, even if you don’t have a DVD drive on your Mac; there’s also better support for connecting to an external monitor while running Parallels Desktop in fullscreen mode, and editable keyboard shortcuts make it easier for users to tweak their Windows setup. And lest you think all the improvements are focused around Windows, Parallels Desktop 9 also has better integration with Linux guest OSes. Parallels Desktop is currently available as a $50 upgrade for existing users of Parallels Desktop 7 or 8; those who purchased Parallels Desktop 8 on or after August 15 can upgrade for free. New users, however, will have to wait until September 5, when they can pick the app up for $80. A student edition will run $40, while the Switch to Mac Edition, which incorporate extra tools to migrate from a PC to a new Mac, costs $100. Also included with Parallels Desktop 9, for a limited time only, is a free six-month trial subscription to the company’s recently released Parallels Access, which lets you access your Mac apps from your iPad.